The EtherTek 4~20 ma to 1~5 dc converter is a device that takes 4~20 ma from sensors and converts it to 1~5 volts dc that can be read by your hand held DVM or remote monitoring board. The EtherTek 4~20 ma to 1~5 dc converter is a passive control device only, and requires either a hand held DVM, RMS unit, or any measurment device that can read 1 to 5 volts dc. 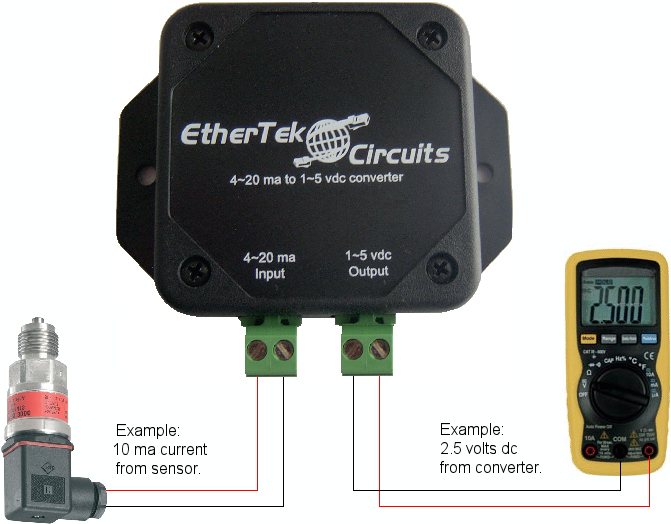 The EtherTek converter does not require an external power supply. A precision 1% resistor is used for accurate current to voltage conversion. Mounting flanges, plugable connectors, and a screwdriver are provided for easy installation.